Thanks to Carrie, Deb, Jen and Stacey, Nellie and Rusty for those pics. 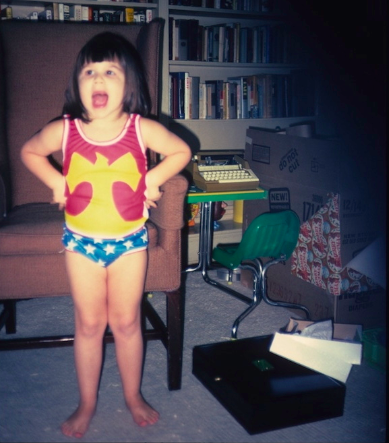 Obviously, something about those superheroine-themed underpants must have been meaningful to all of us girls, or else we wouldn’t have posed for photos in them. Look at how proud we all are, as we should have been, because we were incredibly awesome. Little did our parents know when buying us those red, blue and gold undergarments that they were raising a secret generation of incognito superhero girls. (Or maybe they did!) I had all but forgotten that I was once Wonder Woman. But now I’m glad that I was, and that I was not alone. We want to find more of you out there. Bex and I have started a Tumblr called Small Wonderoos collecting these old photos. If you are a member of the sisterhood, please check us out and submit your own. And think about how wonderful we all are.